Picking up where I left off with The Geography of Japan, this post is about the country’s regions. Japan consists of four large islands and many, many small ones. Starting at the north end and moving southwest, the main islands are called Hokkaidō, Honshū, Shikoku, and Kyūshū. The small islands that form a chain continuing to the southwest are the Ryūkyū Islands, often referred to in Japan as the Southwest Islands (“Nansei-shotō”). Administratively, Japan is divided into 47 regions, called prefectures, but traditionally speaking, Japan has nine regions. Dark blue: Hokkaidō (“North Sea Circuit”). Hokkaidō only became part of Japan in the late 19th century and was originally the home of the Ainu people, hunter-gatherers ethnically distinct from the Japanese. Hokkaidō has fewer people and somewhat wider vistas than the rest of Japan, and it has some European-style farms and pastures. The island’s biggest city is Sapporo, birthplace of Sapporo Beer. Gray: Tōhoku (“The Northeast”). Tōhoku has the image of being a remote mountain backwater. These days it’s also known for ski resorts. Pink: Kantō (“East of the Barrier”). The Kantō Plain is filled with the Tokyo metropolitan area, now the cultural and economic heart of Japan. Reddish: Chūbu (“Central Region”). Chūbu contains Japan’s tallest mountains, the very highest being Mt. Fuji. The region is really made up of four isolated centers of culture and population. On the Pacific coast is Nagoya, home of Toyota, and deep in the mountains is Nagano, host of the 1998 Winter Olympics. The Japan Sea coast has Kanazawa south of the peninsula and Niigata north of the peninsula. Green: Kansai (“West of the Barrier”), also called Kinki (“Neighborhood of the Capital”). Kansai is home to Kyoto, the old capital and still the center of traditional Japanese culture. Kansai is also home to Osaka, which was the economic center of Japan until Tokyo usurped that role in the last century or so. Yellow: Chūgoku (“Middle Country”). The name comes from when provinces were classified as being a short, medium, or long distance from Kyoto. “Chūgoku” is also the name for China (“The Middle Kingdom”), so to avoid confusion, the region of Japan is also called San’in-San’yō, meaning “Shady Mountain-Sunny Mountain,” referring to the region’s north and south sides, respectively. Purple: Shikoku (“Four Lands”). The island’s four modern prefectures correspond to its four old provinces. Shikoku is a bit isolated and its mountainous interior is only sparsely inhabited. Light blue: Kyūshū (“Nine Provinces”). Before the late 19th century, Kyūshū was Japan’s gateway to the outside world. Contact with China and Korea usually passed through the north end of the island and contact with the Ryūkyū Kingdom came through the south. During the late 16th century, Nagasaki, in western Kyūshū, flourished as a Dutch trading port, and then during the 200 years when Europeans were barred from entering Japan, the Dutch were allowed to continue trading at an artificial island in Nagasaki Bay. And yet, despite Kyūshū’s role as conduit to the rest of the world, in the old days court officials from Kyoto regarded assignment to a post in Kyūshū as practically exile. Orange-ish: The Ryūkyū Islands. The northern half of the chain is administratively part of Kyūshū and the southern half makes up Okinawa Prefecture. The islands below the red line were formerly the Ryūkyū Kingdom, whose culture was distinct from Japan and whose languages form the only other branch of the Japonic language family. The Ryūkyū Kingdom became a tributary state to China’s Ming dynasty, and then from 1609 also paid tribute to Japan’s Satsuma province. Japan annexed Ryūkyū in 1879 and mandated that school be conducted in Japanese. As a result, the Ryūkyū languages are disappearing. And that’s that. Someday I might do a post for each of the nine regions, but not today. Next up is flora and fauna. Following my basic introduction to Japan, this is an overview of Japan’s geography. 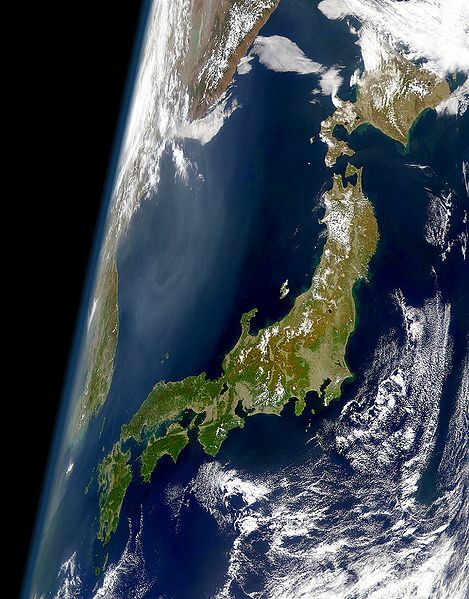 Japan is located in East Asia, off the coasts of China, Korea, and Russia. The northern end of Japan is at roughly the same latitude as the cities Milan, Montreal, and Portland, Oregon. The southern end of the main islands of Japan is at roughly the same latitude as Shanghai, the mouth of the Nile river, and Austin, Texas. The string of small islands that makes an arc from the bottom of the main islands to Taiwan is also part of Japan, and its southern end is at about the same latitude as Cuba. Mountains account for 73% of Japan’s land, and most of the country’s people are crammed into what little flat land there is. In this fantastic satellite image from NASA (via Wikipedia), the concrete-gray population centers are clearly visible. The biggest urban area, at the elbow of the main island, is the Tokyo region. Forests cover most of the land that isn’t either urban, rocky mountain, or agricultural. In the satellite image, only the south is green, but that’s because the picture was taken in April, when spring was well underway in the southern half of the country, but when plants in the north were still waking up. Japan is mostly in the temperate zone and thus experiences the four seasons distinctly. Summers are hot, winters bring snow, autumn is colored by red maple leaves, and spring begins with cherry blossoms. Except at the north island, there is also a month-long rainy season in early summer. Additionally, typhoons occur through summer and into early autumn. Each storm typically starts in the south and sweeps up the length of the archipelago, weakening along the way. Japan’s weather isn’t the same all over, however. The country’s dividing mountains and span of latitudes create several climate zones. Pacific Coast: Hot, humid summers and mostly dry winters. Inland Sea: (The area between the main island and the smaller two of the four big islands.) Has weather similar to the Pacific Coast, but it’s sheltered from storms and has more sunny days. Japan Sea Coast: Somewhat cooler summers and heavy snowfall in the winter, due to winds from Siberia. Central Highlands: (A small region in the mountains in the middle of Japan.) Has a more continental climate, with a large contrast between daytime and nighttime temperatures. Hokkaidō: (The northern island.) Cooler and less humid than the rest of Japan and with less precipitation. I’ll stop here and talk about regions and flora and fauna in separate posts; this post was too long with those sections included. You are currently browsing the Erratic Dispatches blog archives for September, 2009.